One year ago, you couldn't walk two feet without hearing someone scream about the Men's World Cup. The streets were like minefields of amped-up day-drinking men who could spill out of a bar at any moment and knock into you, never taking their eyes off the soccer match. But today, you can walk down most American streets in complete peace, despite the fact that the U.S. team is advancing to the Women's World Cup finals. If this had been the men's team, you'd probably be unconscious by now. The disparity between the two World Cups is astounding, and the general sentiment that the women's tournament matters less has people giving excuses not to watch the final. But there are several reasons why these excuses are nothing more than balderdash. During Tuesday night's nerve-wracking game, Germany almost broke the U.S.'s perfect defense streak when American defender Julie Johnston fouled against Alexandra Popp and got a yellow card. German striker Celia Sasic had the chance to score for her country with the penalty kick, but missed — Germany's first penalty kick miss in a Women's World Cup match. The U.S. eventually came out on top with a penalty kick score and then another goal, beating Germany 2-0. Even to a soccer neophyte, that sounds like an exciting match. And you don't have to know anything about soccer to recognize that the U.S.'s advancement to the final is a big deal. However, the Women's World Cup has been plagued by empty stadiums, low ratings, and a general disinterest in the entire tournament (perhaps fueled and perpetuated by an overall sexist view of women athletes), which is a frighteningly stark contrast to the general attitude about the Men's World Cup — or, to many people, the only World Cup. If you're tired of hearing people give excuses for why they won't be watching the Women's World Cup finals, aka one of the biggest nights in sports, especially for the U.S., here are five arguments you can use to shut them down. Excuse: "I Don't Like Soccer"
First of all, welcome to my neighborhood. Second of all, it doesn't matter. Whether or not you like soccer — or even sports in general — this is a huge moment in history for the U.S. The last time the U.S. won the Women's World Cup was more than 15 years ago, in 1999. So, if you don't watch for the actual sport, watch it for your country. Excuse: "The Final Is Not That Big Of A Deal"
Uh, yes it is. It's the World Cup final! And there's a pretty big chance that we'll get sweet, sweet redemption this year if Japan beats England in the semi-final. For those who follow the sport, you might remember that Japan defeated us in the 2011 final, and we've never really gotten over the sting of that loss. So, even if you don't like soccer or sports, you can't say you don't like a great comeback story. Excuse: "I Don't Know Where To Watch It"
Well, you're in luck. 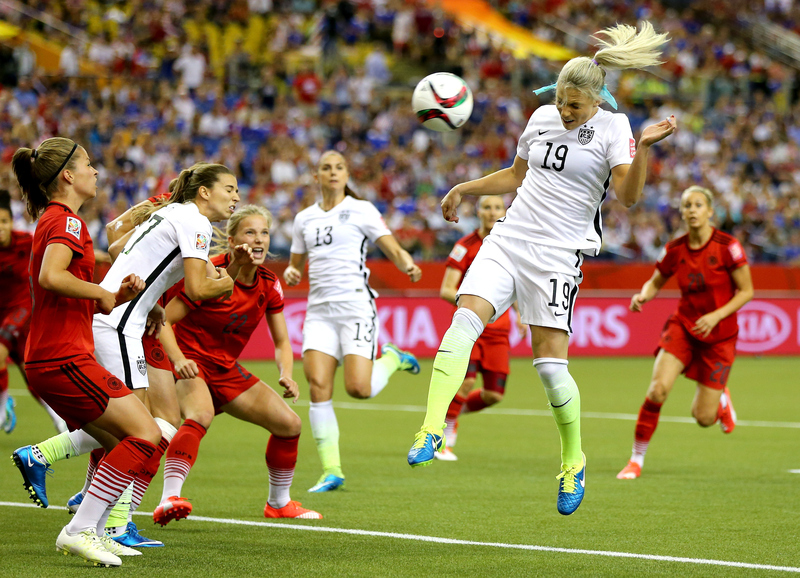 This year, Fox has been providing unprecedentedly comprehensive coverage of the Women's World Cup. Not only is it airing all 52 matches between June 6 and July 5, but the semifinal, third-place match, and final will all air in prime time. Excuse: "I'll Be At Work"
Have you ever heard of live streaming or, I don't know, the Internet? You can live stream the final here (a Fox Soccer2Go month pass is $19.99) or follow the match with live updates here. Excuse: "It's Only Women's Soccer"
First of all, if you think that women's soccer is inferior because of the gender of the players, then you seriously need a reality check. Not only have female players proven that they're tougher than male players by faking way less injuries — even when they get banged up way more on that sad excuse for turf — and by playing with equal, if not more gusto when getting paid a paltry fraction of what the men make, but has the men's team ever made it to the World Cup final, let alone won? This will be the fourth time the U.S. Women's National Team has advanced to the final, and could be its third victory — in a much shorter World Cup history, no less.